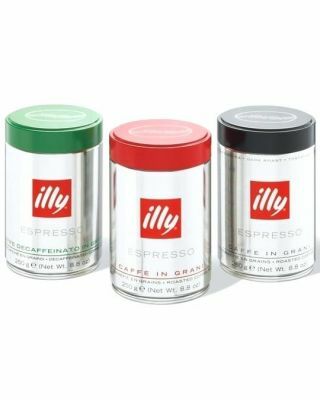 Global brand leaders illy coffee was established in 1933 where company founder Francesco Illy developed the modern espresso machine. A rich symphony of nine pure, sustainably grown Arabica beans from four continents – delights millions of coffee lovers every day in 140 countries, both at home and in quality coffee establishments. The illy blend is described as 'Rich and full-bodied, yet velvety smooth' which is distinctly illy. True Italian in character, illy positions its brand at the premium end of the market. We sully Illy coffee beans, filter and coffee capsules, expertly roasted with their seceret 100% Arabica beans recipe which are all available in 3 roast blends, medium roast, dark roast and decaf.